NanoStudio is available at a special introductory discount of 25%! Record samples using the built-in microphone*, resample NanoStudio’s own output or upload your own samples over WiFi using our NanoSync tool for Mac or Windows. NanoStudio comes with a range of samples, loops and drum kits to get you started. Whether you want to create full pro sounding tunes or simply need a musical sketchpad, NanoStudio can do it all. To hear the results for yourself head on over to our website where you can listen to the demo tunes and download the Mac and Windows versions for free. 4 subtractive synths with 8 voice polyphony. Each synth has two dedicated insert effects and can use samples or dual oscillators in mix, ring or sync configuration (choice of 36 different waveforms). Each voice has a 2 pole resonant filter, 3 envelope generators and 4 LFO’s, all configurable via a patchbay. Perform and record controller movements using dual X/Y pads, a pitch bend wheel and accelerometer. 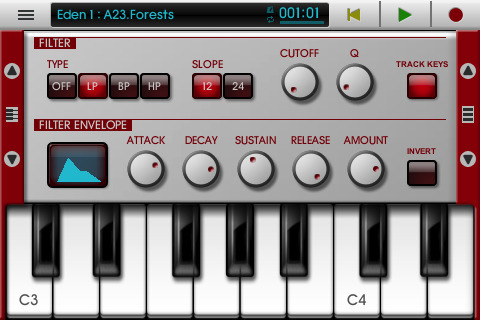 NanoStudio comes with 128 ready-made synth presets to get you started. Edit your samples using NanoStudio’s built-in wave editing tools (with multiple undo/redo) and record your performance using the synths or the 16 sample trigger pads. Adjust pitch, pan, volume and envelopes and assign each sample to one of the 3 output busses, each with its own effect sends and filter setup. Use Nanostudio’s mixer to monitor levels and get your final mix just the way you want it. The mixer’s two global effects sends allow you to individually apply reverb and delay effects to each track. When you’re ready to share your mix with others, use NanoSync to copy the exported .wav file to your Mac/PC over Wifi. Audio cut and paste and MIDI export are coming in the first update.